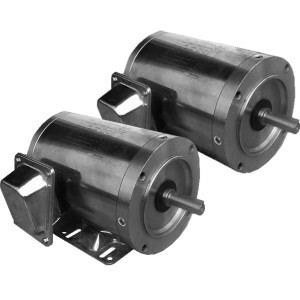 Our Stainless Steel / Washdown Duty motors are rated for a 1.15 service factor (1.0 w/ AC Drive), feature a TENV enclosure (rated IP56), and double lip seals on both ends of the motor with an additional shaft slinger for added protection. O-rings are also installed on end bells & through bolts. They come with a 304 stainless steel shell frame, stainless steel shaft, and a watertight cord connector with a junction box.